Show your love for greyhounds this Valentine’s Day! 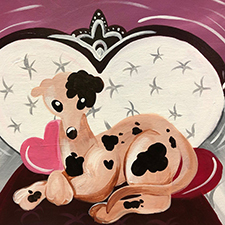 There’s no better day than Valentine’s Day to paint a beautiful photo of your greyhound while sipping wine at Uptown Art in Sussex. The $40/per person fee includes a 16×20″ canvas, instruction and all materials. This will be a guided step-by-step class. Beginners are welcome! A portion of the proceeds go to GPA-WI to help find homes for retired racing greyhounds.